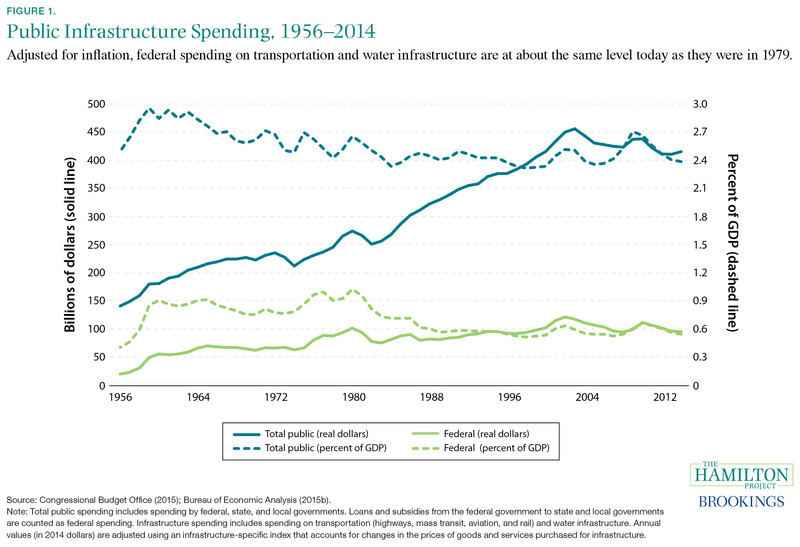 It’s no secret that the infrastructure in the United States is underfunded, under-maintained, and, consequently, crumbling in many communities across the country, as it has been over the course of the past five decades. In fact, our infrastructure, which includes everything from transit and roads to energy and drinking water, has deteriorated so much that the American Society of Civil Engineering recently awarded a D+ rating to describe its overall health. The good news is that we already know that investments in infrastructure can go a long way toward not only improving the condition of infrastructure across the country but also bolstering the broader economy. In the near term, infrastructure projects can spur local economic activity, and increase employment. And in the long run, according to Josh Bivens of the Economic Policy Institute, different levels of investment—be it stopping scheduled funding cuts, focusing on green strategies, or closing the “infrastructure deficit”—will provide better paying jobs for those will less education and help improve overall U.S. economic growth and productivity. Yet how exactly do policymakers jumpstart these efforts? Over the years, as federal funds and grants have decreased, most of the responsibilities for urban renewal and infrastructure development now fall upon local governments . Municipalities or local development authorities are then left to figure out how to raise the money to make it happen. Although there are many innovative methods of financing local development, more often than not municipalities today rely on a tool called Tax Increment Financing , or TIF—a highly efficient closed-loop funding mechanism that functions a bit like a credit card, enabling local governments to borrow from future tax revenue to pay for improvements now. To best explain how it works, let’s say there are a several dilapidated buildings and roads across a few blocks within a city. In its current state, developers are apprehensive about investing in real estate there. So, the property is stuck in limbo, with great potential but still blighted. In this case, a municipality or its local development authority may propose making it a TIF district in order to finance its renewal and attract development. Once an ordinance is passed, the TIF authority will draw a boundary around the site and declare it a TIF district for a certain time period, say 10 years. At the start of this designation, the TIF authority will calculate the site’s initial assessed value —essentially the estimate of a property’s dollar worth, from which property taxes can be calculated. They will hold this “base value” constant throughout the lifetime of the TIF. Then, in order to start treating or improving the structures and streets, the TIF authority will sell bonds secured against the TIF district or reach some other agreement with the vendor or developer handling the clean-up efforts. As the site’s quality improves, the assessed value of the district increases over the 10-year span. The TIF mechanism allows the TIF authority to earmark the project’s new property tax revenue (minus the property revenue they calculated earlier based on the initial assessed value) to finance the development, such as paying off the bonds. Basically, all of the newly generated property tax revenue during the lifespan of the TIF district goes back to the TIF authority while only the base-value revenues are distributed among the usual taxing bodies within the TIF district. In other words, over 10 years, if a TIF district has other overlapping jurisdictions, such as counties, school districts, or park districts, these entities will only receive the property tax revenues based on the initial assessed value. At the end of the 10 years, the site is officially improved, and the TIF district is closed. At this point, all of the property tax revenues, expected to be much higher than before since the assessed value of the area has increased, are funneled to the original taxing bodies. Tax Increment Financing is not necessarily a new tool. The idea for it began percolating in the 1950s, when California used it to secure matching funds from the federal government for redevelopment projects. But widespread uptake of this financing tool did not begin until the 1970s, when federal funding for urban renewal shrank, compelling cities to take matters into their own hands. Since then, 49 states and the District of Columbia have adopted appropriations for TIF districts, with the only holdout being Arizona. Chicago, for example, is famous for their use of Tax Increment Financing: The city opened its first TIF district in 1984, and they now have more than 160 TIF districts covering 30 percent of the city’s land area. Today, it is probably the most widely used development method in the urban planning toolbox. On paper, Tax Increment Financing sounds like the miraculous (and popular) pathway to improving infrastructure, especially considering that it doesn’t add new taxes or alter existing tax rates. Basically, it’s self-sustaining. But in practice, it has some serious implications, one of which is gentrification. In recent years, urban planners have increasingly misused Tax Increment Financing for economic development instead of urban renewal. If city policymakers want to incentivize retail businesses to set up shop in a new area, for example, they can establish a TIF district to help assist developers and private businesses with development. While publicly subsidized private development may increase tax revenues and even boost downtown economic growth, these practices can hasten the process of gentrification and the consequent displacement of vulnerable groups. A report by the Front Range Economic Strategy Center finds that in Denver’s downtown, areas that historically are home to low-income, minority residents, TIF districts are associated with rising property values, shrinking affordable housing stock, and an increasing share of white residents. To make matters worse, TIF investments often already occur in rapidly-gentrifying places, as seen in Chicago , because they offer the greatest yield of property tax revenues. But this means that places that can benefit from urban renewal don’t necessarily receive the equitable attention or TIF money they deserve. All this is not to say that Tax Increment Financing cannot be a viable way for local policymakers to improve infrastructure and neighborhoods while simultaneously increasing local economic growth. Whether this means using alternate tax revenue other than property taxes to pay back bonds or mandating more affordable housing units in a TIF district, policymakers need to pay attention to the equitable deployment of Tax Increment Financing.